Your loved one is diagnosed with Dementia or Alzheimer's. Life as you know it will change forever. Alzheimer's, Dementia, Coma and other illnesses steal our loved ones away from us. The Alzheimer's Alternative Care class is a communication tool of support that is "outside the box" of conventional "main stream" practices. Through these messages you will learn how to communicate with the Higher Self of your loved one to aid your journey as you walk the pathway that is silent of coherent communication. The Higher Self is our superconscious Spirit, God Part or Divinity within. It is who/what we are without our physical body. It is the connection we have with one another - our union with God, The Creator of All That Is. Kate will walk with you hand in hand to identify and release judgment, anger, helplessness and fear to move to a place of possibility in love to bring you and your loved one comfort and peace. It does not matter if you are experienced in meditation or not, this class guides you through all the steps to clearly communicate with your loved one who is locked inside their physical body. 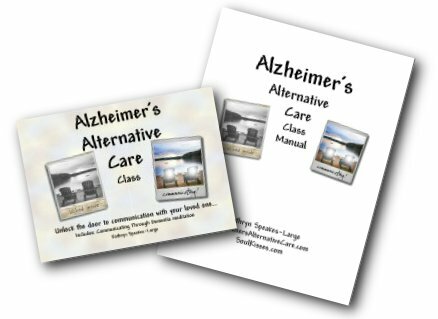 To download the Alzheimer's Alternative Care Program, please right click here. To download the manual for the program, please right click here. NOTE: Be sure to save the digital files to a safe place on your computer. To save, RIGHT click each link and choose "save as," "save target as" or "save link as" (depending on your browser) then save each audio file to a place on your computer that will be easy for you to find. MAC users use control and click. This meditation is free. If you have received spiritual food from the meditation and Soul Kisses website and wish to feed your financial flow through a tithe, you may do so by clicking the button. PayPal provides our secure server - NO PayPal account required.